Acupak located in Melbourne Australia, supplies medical therapy laser equipment, particularly low power laser therapy units. Our most recent model for sale, the CL Plus laser is a therapeutic laser, designed for universal application on larger wounds, dental applications, physiotherapy and laser acupuncture. Our standard model the CL Mini is an 8mW laser appropriate for laser acupuncture applications. Acupak lasers are approved by the TGA (Australian Therapeutic Goods Authority). Acupak now offers the 100mW laser. The 100mW laser improves penetration depths, reduces treatment time and comes with all the standard features of the CL Plus. Ear Nose and Throat suitability. The laser point detector unit is used to accurately gauge acupuncture points. The unit runs on a CR 1/3 battery and is shipped with a battery. 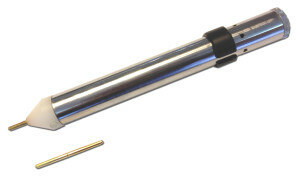 Includes a pointed sensor tip, a round sensor tip and a convenient storage case. If calling Internationally phone 61 3 9822-5454.